CAMELEON Association France leads and fosters a network of international branches and partners. CAMELEON’s international branches are associations under its name, lobbying for the association with local institutional and economic decision-makers, the general public and the media and fundraising to ensure the sustainability of the association’s actions and programs in the Philippines. 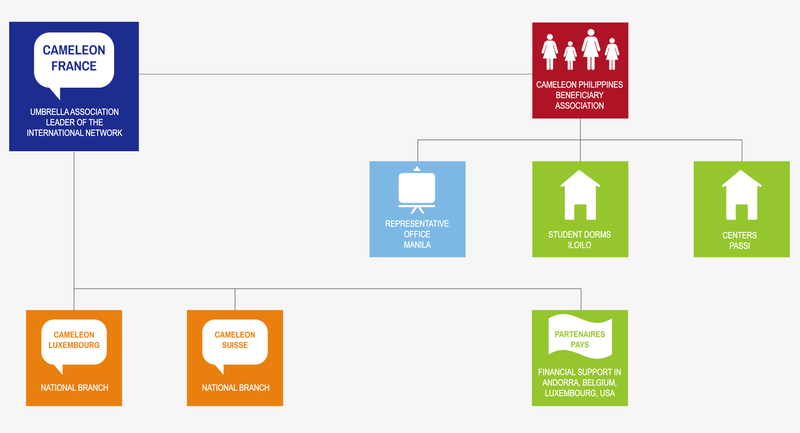 CAMELEON currently has two branches: CAMELEON Switzerland and CAMELEON Luxembourg. A donation of 30€ will only cost you, in the end, 7,5€. CAMELEON France relies furthermore on a team of about forty regular volunteers that support the development of our actions (community life, craft sell, local partnerships, interactions with schools, events, translation…). On top of that, about thirty occasional volunteers get organised during events planned by the charity. To know more and become a volunteer. Please make payable to « Association CAMELEON » and send to ASSOCIATION CAMELEON France: 32 rue Robert Lindet – 75015 Paris, France.